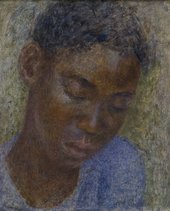 Seeing Africa is a display of 'Africaniste' paintings and sculptures – a genre little-known in Britain but familiar in continental Europe, encompassing European artists making representations of Africa and Africans. Seeing Africa has been selected from one private collection. Some of the images are the lesser known work of prominent artists. Some are by obscure figures about whom little is known. What these artists have in common is a specific way of seeing and representing their subjects. These works were made between 1880 and 1960 during the colonial occupation of areas where European rule left a legacy of violence. But for most of the travelling European artists, the people they saw were simply part of a vista of African flora and fauna. Some, like Floris Jespers, Andre Hallet and Arthur Dupagne, fell in love with the continent and died there, but the distinguishing feature of their work was an obsessive and overwhelming sexual vision of African bodies. When the entertainers of the Jazz Age, during the 1920s and 1930s, arrived on European stages, the imagery they adopted, dominated by rhythm and 'jungle' poses, was already an essential foundation of the Africaniste aesthetic. These works pose complex questions about representation, about the interplay between artist, subject and viewer, and about the role of the artist within a fragile social and political environment. The works can be viewed in several contradictory ways - as a historical exercise in colonial propaganda, as a network of romantic illusions, as a valiant attempt to grasp the essence of another culture, or even as a transcendent vision of beauty. The labels in this room feature a range of opinions intended to encourage debate. The contributors include: Hassan Arero, the keeper of anthropology at the Horniman museum, Freddie Booker, a decorative arts entrepreneur who owns the collection on display, and Mike Philips, a writer and Tate curator.